There are great rock ‘n roll bands, and there are legends. The Zombies fall in to the later category, having formed in 1962 and became one of the top selling British groups of the 1960s. Original members Colin Blunstone (vocals) and Rod Argent (keyboards / vocals) front the current incarnation of The Zombies, who will be celebrating the 50th anniversary of their ‘Odessey And Oracle’ album, with a tour that reunites the present band with all surviving original members. Madison’s Barrymore Theatre will present this momentous event on Saturday, April 15. Prior to hitting the road, Maximum Ink’s Sal Serio spoke with Colin Blunstone. MAXIMUM INK: You’re very busy with promotional work leading up to this next tour. That is wonderful to see! COLIN BLUNSTONE: Totally unexpected. Neither Rod nor I thought that we would be touring at this time in our lives. And to realize that there’s so much interest in The Zombies after all this time… it’s really exciting! MI: It must be gratifying to be recognized for your entire body of work, not just ‘Odessey And Oracle’, all these decades later, and especially the acclaim those songs get from your fellow musicians. CB: It is incredible, isn’t it? Peer group acceptance is what every musician craves. When wonderful artists cite The Zombies as an influence in their careers, or might say how much they’ve enjoyed listening to ‘Odessey And Oracle’, it really does make it all worthwhile. MI: The ‘Odessey And Oracle’ 50th anniversary tour comes to the Barrymore Theatre in Madison on April 15th. CB: We’re all really looking forward to coming up to Madison, and looking forward to this tour. This will be the last time we’re going to tour ‘Odessey And Oracle”, so I always say to everyone, if you ever wanted to hear ‘Odessey And Oracle’ live, now might be a good time to come. I think there’s only so many times you can go back over the past, and Rod and I are both people who like to think about the future. We like to write and record new songs, and that’s where we want our focus to be after we finish this tour. MI: Your most recent album, ‘Still Got That Hunger’, came out in 2015, and it sounds like there are plans for a new release sometime soon, correct? CB: Absolutely yes. ‘Still Got That Hunger’ actually got in to the Billboard Top 100, which was a wonderful surprise! To be honest, we weren’t expecting to chart, but it was great. Just like the old days! We are already thinking about our next album, and as the songs are being written, we will probably be recording all this new material next year… which could mean that the album won’t be released until the year after. It seems like such a long way off, but with our touring schedule, there’s no way around that. MI: ‘Still Got That Hunger” is to be available as a vinyl LP on this current tour, correct? CB: It certainly has been pressed on vinyl, and I’ve been signing… (laughs) my room is full of signed LPs! It’s absolutely full of cardboard boxes. MI: Also, there is the new coffee table book ‘The Odessey’, which I hope will also be available on tour. CB: Yes! It will be available, and I’ve only seen a finished copy quite quickly, but it really looks magnificent. 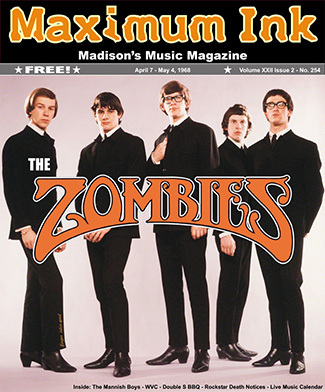 There are wonderful quotes in there, from people like Clive Davis, Carlos Santana, Tom Petty, Graham Nash, and Paul Weller, all commenting on, and offering insight in to, The Zombies. Also, there are great, very rare, photographs, many I’ve never seen before. Overall, the production value on the book is very high. It is a lovely book, and I certainly would like to get a copy of it myself. I think it’s going to be very popular. MI: What was the process of assembling this book? CB: The backbone of the book is ‘Odessey And Oracle’, and one of our co-managers, Cindy da Silva, and the people at BMG Records, chose some other tracks, to have the lyrics handwritten by the writer, and to have comments on those tracks. So, I wasn’t really privy to the process [of] how the book was put together. But I was involved in that I was given a list of tracks, as was Rod and Chris White, and we were just asked [for] a short comment on each. MI: Am I correct that this tour will be two separate sets, one with the current touring band, and one with the surviving original members? CB: Absolutely. I think it’s going to be great fun. The first half will be with Jim Rodford, Steve Rodford, and Tom Toomey, and we’ll play some of The Zombies hits that weren’t on ‘Odessey And Oracle’, some brand new songs, and we’ll also play some quite obscure songs as well. In the second half we’ll be joined by Chris White and Hugh Grundy, AND the present incarnation of the band. Darian Sahanaja, who is the keyboard player for the Brian Wilson band, will be playing second keyboard, and also Chris White’s wife Viv, [who] is a very good harmony singer, will be helping with the harmonies as well, so it’s going to be a big sound. But, having so many people involved enables us to recreate every note that was on ‘Odessey And Oracle’. We’ll play it from track 1 to track 12 straight through, and we’ll play every note that is on that record. MI: Wow! That’s going to be incredible. I can’t wait. So… are you ready to step back in time a little bit and talk about the past? CB: Absolutely! Listen, I’ve spent most of my life stepping back and talking about the past! I always joke with people that often an interview starts with “let me take you back to 1961”, and I go “No-o-o-o-o-o-o! !” (both laughing more) but, yeah, I’m fine. I’m ready! MI: Well, I wanted to talk about the present and the future first, before going back in time! CB: Yes, well, take me back… but I want to be 15 again! MI: And we may be going that far back! I’m curious about the early influence of church choir on your singing. CB: I don’t think that’s particularly on my singing. I did actually sing a little bit as a soloist when I was a very young boy, not in church, but in my school. Up until I was eleven. But when I went to my second school, music wasn’t a big deal, so it just happened [that] my parents managed to get the money together to buy me a guitar. It was a big thing for them to do! All of my singing from the age of 11, was at home playing the guitar. Where the church influence probably comes from, is from Rod, because he was a chorister in St. Albans Cathedral for 7 or 8 years. So, his knowledge of harmonies and phrasing was quite sophisticated at 15 when the band first got together. I was a very naïve singer. I was singing from the heart, but I didn’t know anything about phrasing or singing technique. I was just going for it. So, I learned a lot from Rod, especially in those early years. Even now we will discuss a song in great depth, spending a few hours, before we play it to the rest of the band. MI: The Zombies song “She’s Not There” was a massive success here in the United States. And that was fairly early in the band’s career. Can you reflect on the impact that song had on your lives? CB: It changed our lives completely. You know, so much in life is down to chance. We won a big rock and roll competition which, one way or another, led us to Decca Records, who introduced us to the producer Ken Jones. Before we were going in for our first session at Decca studios in West Hampstead, in London, Ken was talking to us and just as an aside, he said, you know, when we do this session you could always write something for it. We were going to do rhythm and blues classics, but Rod and Chris took notice of what he said, and went away and wrote. Rod wrote “She’s Not There” and Chris White wrote the B-Side “You Make Me Feel Good”. I was absolutely astounded. I had no idea that either of them could write songs. In fact, unbeknownst to me, I think it was Rod’s second or third song, but he’d never played me the other songs. I think it might have been Chris’ first song. We knew straight away that “She’s Not There” was a special song. We recorded it fairly easily, and it went on to be an immediate hit in the U.K. It was a little bit slower in America, but it completely changed our lives and began us on this 53 year journey as professional musicians. It all goes back to “She’s Not There”. MI: The album ‘Odessey And Oracle’ was recorded in Abbey Road Studios right after the Beatles finished ‘Sgt. Pepper’s Lonely Hearts Club Band’, and I believe you used the same Studer 4-track machine. CB: We did. The Beatles mostly recorded in Studio 2, but they did record in Studio 3 [also]. We recorded mostly in Studio 3. We were using the same engineers that they used, Geoff Emerick and Peter Vince, and some of the same equipment they used. One of the interesting things, they had literally just left the studio, and John Lennon left behind his Mellotron, and we used that Mellotron on ‘Odessey And Oracle’. It probably would have sounded a very different album if he hadn’t left his Mellotron there. There were tambourines and maracas and whatever else lying around on the floor, that we also used. It was quite exciting for us, because we were big fans of The Beatles, and we realized we were the next ones in the studio after them. MI: Had you met The Beatles prior to that? Were you friends? CB: No, we hadn’t. I think prior to that I had said hello to them backstage at one of their shows, but I don’t think they would particularly know me, or any of the other guys in the band. Rod has subsequently toured with Ringo Starr’s All-Starr Band, so he knows Ringo quite well. But, we never played on the same bill as them, so unfortunately we didn’t get to know them. We were great fans of theirs though, and I still am. MI: There was an original mono mix of ‘Odessey And Oracle’, but then the record company demanded a stereo mix. Which was the superior version? CB: The mono mix was done quite quickly and with a very limited budget [but] I think the mono mix is the superior one, myself. MI: Shortly after the recording of ‘Odessey And Oracle’ The Zombies broke up. History sorts of paints this as a dark time for the band, but what was really going on? CB: More than anything, I think we were tired. We played nearly every night for three years, all around the world. We hadn’t been very well managed, which, if we had been looked after properly, I think quite possibly that the band could have gone on. But, some of the situations we found ourselves in were very demanding and very draining, and if we had proper management things could have been very different. The other thing is, I think we were always looking at the U.S. charts, and the U.K. charts, and what we forgot was, we had always had hit records somewhere in the world. We only realized [this] after… a year or so later. Unfortunately, without the Internet, it was often hard to know at the time where you were being successful. Only later you would find out you were having successes in the Far East, or Scandinavia, or Australasia, or something like that. We always had hits somewhere. Maybe it was a little bit of naivety that we didn’t realize that we were still a successful band. We perceived ourselves as relatively unsuccessful, [which] actually wasn’t true. With this tiredness creeping in, we probably all felt like we needed a break. And we interpreted that as it was time to move on to fresh projects. We always remained friends, but that’s what happened. It just seemed the natural thing for us to do. We’d made an album, which I truly believed was the best we could possibly do, and the tracks were being released as singles. This is the bit I don’t understand. We actually did finish the band before the album was even released, but at the time, the business was still very singles orientated, and the album was always a bit of an afterthought, [which] all changed after the next few years. Again, perhaps it was all due to tiredness and inexperience [but] I think it would have been better at least to hold the band together until the album was released. MI: I was looking at a preview copy of your new coffee table book, and the story about the… disagreement, let’s say… that you and Rod had during the recording of “Time Of The Season” is humorous in retrospect, but I assume it was pretty serious at the time! CB: (laughs) It was serious, but it was also forgotten an hour later! I think it’s hilarious. The song had just been written, it was the last track that was written for the album. It was finished in the morning before we went in to the studio, so I wasn’t really on top of the melody and the phrasing of the song. I’ll be the first to admit it. We were running out of our budget at Abbey Road, the red light was on, the clock was ticking… there was a big clock right in front of me where I was singing! And, suddenly I lost it, because Rod was coaching me from the control room, through the headphones, and he was sort of saying, “now, this phrasing is not quite that, we want to do something slightly different”, and I screamed through the intercom at him, “Listen! If YOU know it so well, YOU come in here and YOU sing it!” Remember, there would be all the Abbey Road engineers around him, and the rest of the band. I’m not saying this to him… there’s a bit of a scene brewing here! (both laughing) And then he screamed back at me, “You’re the lead singer, you stand there until you get it right!” And in the end, that’s what I did, and I’m really glad, because the track went on to sell 2,000,000 copies. But, to me, the irony is, we were having this screaming match while at the same time I’m singing this lyric “It’s the time of season for LOVING” which strikes me as hilarious! (both laughing) I don’t know the tune, I don’t particularly like the tune, we’re having a screaming match, while I’m singing these very romantic lyrics! In spite of all that, it goes on and becomes a huge hit. I’ve actually thought that maybe we should do this more regularly while we’re in the studio! I’ll go in, I won’t know the melody, I won’t particularly like the song, and we can have a big screaming match while I’m singing, and then hopefully it will be a big hit record. I don’t know, it might be worth a try?! CB: Those are very wise words! But, it’s just a funny thought, you know. It is true, that is what happened, but I would also emphasize that an hour later we were all laughing about it. That argument didn’t change the course of history. It was just the usual mucking about in the studio. MI: I’ve been told from some Vietnam veterans that “Time Of The Season” was one of the songs they’d hear on the radio and it would boost their morale. CB: (gasps) Isn’t that fantastic? That is wonderful. No one has ever said that to me before. It just shows you the power of music, doesn’t it? That’s why it’s so worthwhile giving it everything you’ve got in the writing, recording, and performance areas, that’s [when] it’s so worthwhile, when you hear stories like that. I’m absolutely thrilled to hear that! MI: Before I let you go, I’m curious, what are your favorite songs from The Zombies catalog, and which are your favorites to sing in concert. CB: I would immediately think of two songs that are favorites. “She’s Not There” because it changed our lives. I like it as a song anyway. I think it has a timeless quality about it that makes it as fresh and relevant today as when we first recorded it. So, that will always be a favorite. From ‘Odessey And Oracle’ I’ve always liked “Care Of Cell 44”. Of course I’m wrong here, but to me it sounds like the most commercial track on the record. It’s also a really good, fun, song to sing. I think all the songs on ‘Odessey And Oracle’ are good fun to sing. They’ve got great lyrics, and very memorable melodies.